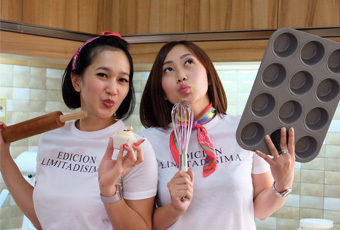 Cupcakes Company was founded by longtime best friend Medina Aprilia and Wynda Mardio. Their friendship and love to good food gave birth to our scrumptious cupcakes recipe. Medina Aprilia is a mother of 3 who gave up her career in Advertising Agency to raised her children. Along the way she spends hours in the kitchen making snacks for her child when she finally found the perfect recipes for our Cupcakes and desserts. Wynda Mardio is a mother of 2 who was a Producer in a National TV Station. At first, she trade her career to channel her cooking passion by opening Steak Hotel by Holycow! at March 2010 and build Bhadranaya Group, which specialize on F&B establishment up until now. Later on, she developed Cupcakes Company with Medina Aprilia, making all these delicious cupcakes and desserts come true. Medina and Wynda opened Cupcakes Company in June 2011. Now baking more than 50.000 cupcakes per month and lots and lots of desserts, Cupcakes Company is growing to satisfy your needs of fresh, moist & scrumptious cupcakes and desserts, made from crafted ingredients.